Old India Postage lettercard 1955 Very beautiful lettercard from India. 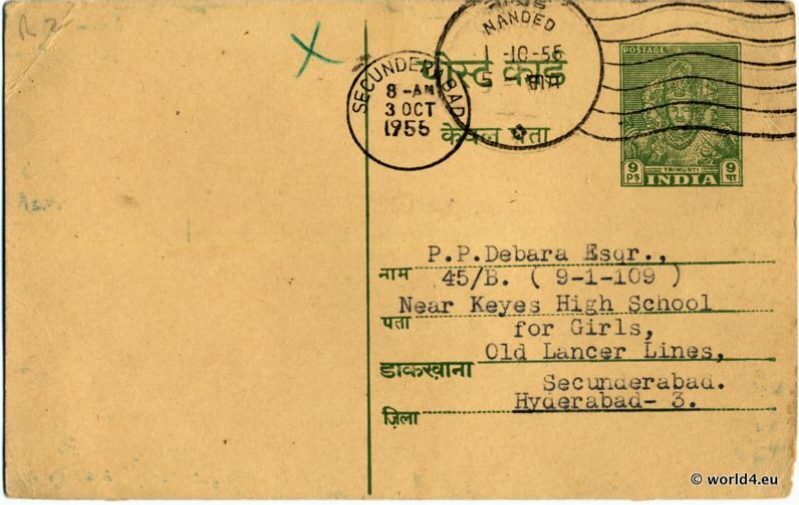 The card was launched on 3 October 1955 at Nanded, Maharashtra to Secunderbad, Andhra Pradesh, near Hyderabad. Arrived in Secunderbad at 8 AM, 3. October 1955. Rangoon, Union of Burma, 1956. Myanmar letter cover. Rangoon, Union of Burma, 1956. Myanmar letter cover. This letter was send at the 13. August 1956 from Rangoon, Burma to Rabenau, Dresden Germany. Nice combination of old burma stamps, postmark, by air mail. Vintage Temperata Pepper Mill from Italy, 1950s Design. Made from olive wood with brass. Steel grinding.